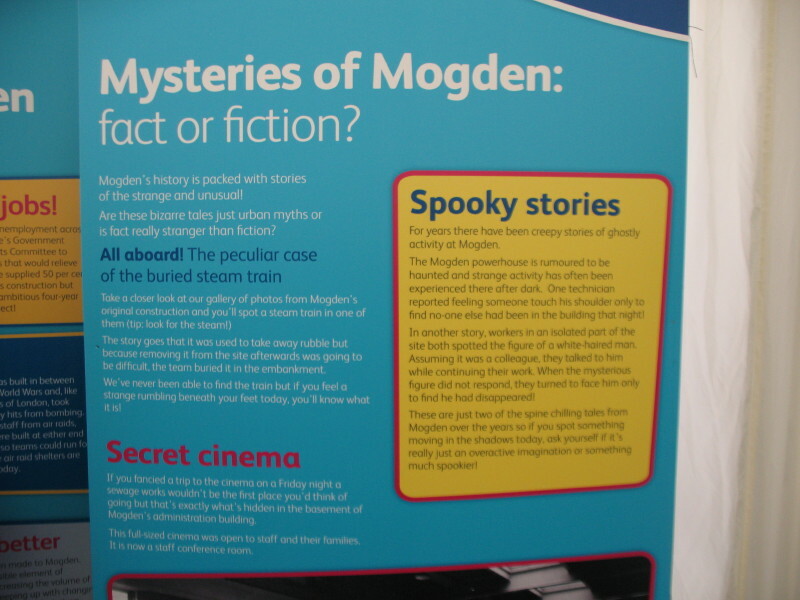 Myself and Ed went to the official Mogden opening today, fascinating place, huge. 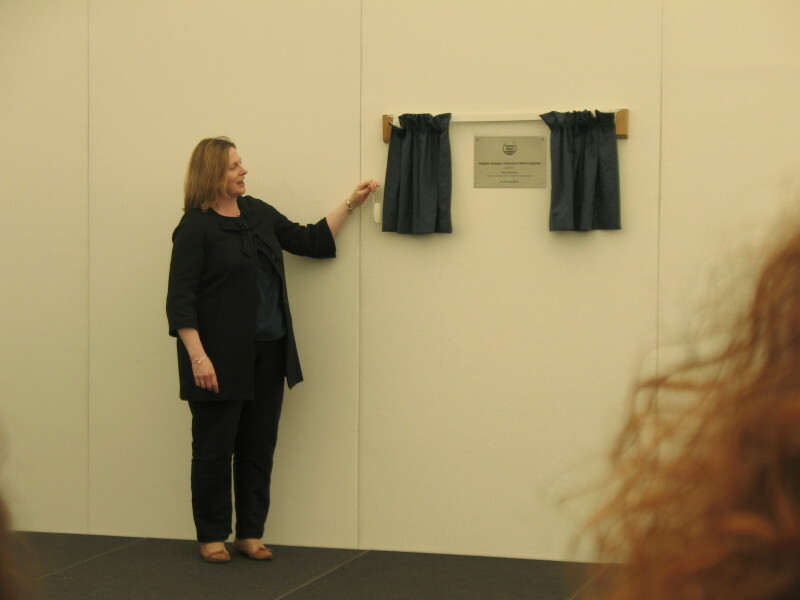 The day started with speeches from Thames Waters CEO, Local MP, a play about cleaning up the tidal by local school children then unveiling of a commemorative plaque. We got the chance to talk to plenty of TW technical guys about how the STW operate and issues around it being on the tidal etc, very clever people. Ed will no doubt do a write up with pics about the bus tour round the place, seeing where all our poo actually gets processed and understanding more about the storm overflows was invaluable. Was very social as well, great to see our Honorary President and talk all things fishy and more. 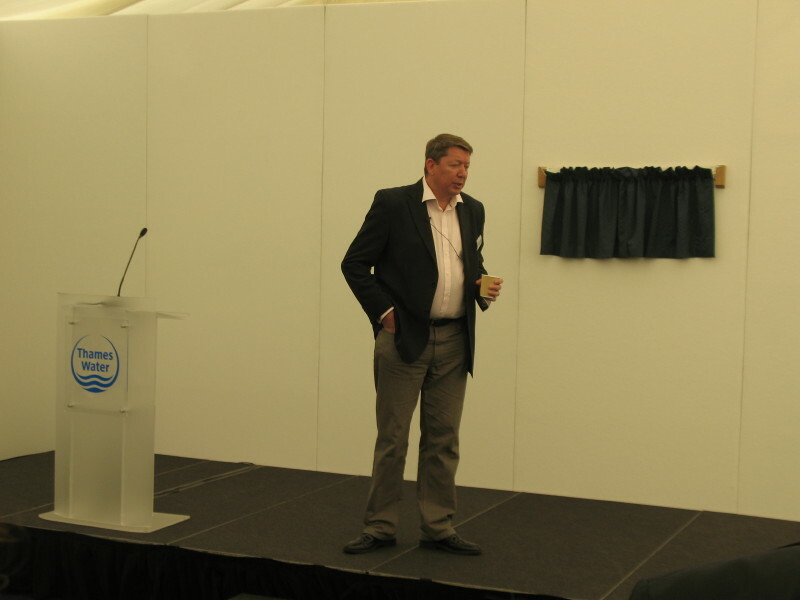 Martin Baggs, head of Thames Water, gave an intro. Contrary to the image portrayed in the papers he came across as a decent down-to-earth bloke. 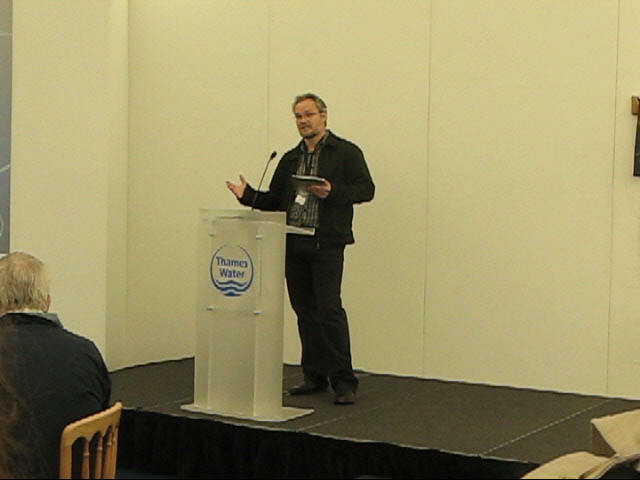 Our own Dave Harvey gave a short talk on June 2011 fish kill and the importance of the Mogden upgrade towards improving the situation, we will work with Thames but will always be on their case if misdemeanours occur. The official bit over, we were given a quick Heath & Safety lecture then a tour of the site. Dave was on the special VIP tour with Martin Baggs, Keith Arthur, and all sorts of other interesting people. Unfortunately, I was not. A quick word with the right people secured me a place however! First stop, the Duke of Northumberland river (an artificial branch of the Crane) runs right through the middle of the site. They abstract a limited amount of water from it for cooling. It looks pretty healthy here. 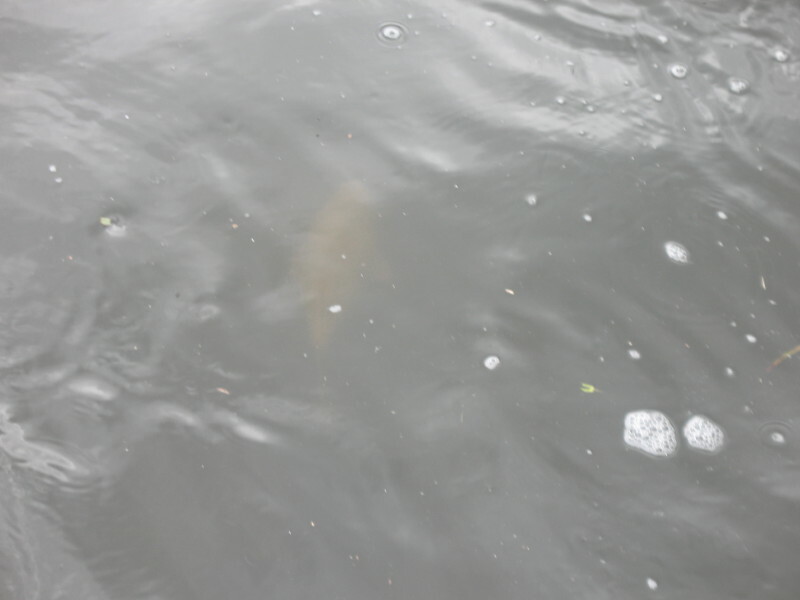 Just by the main entrance lives this ghost carp, 5-8lb maybe. First fish I've seen in the Crane/DNR since 2011. A view across the site. It is vast. 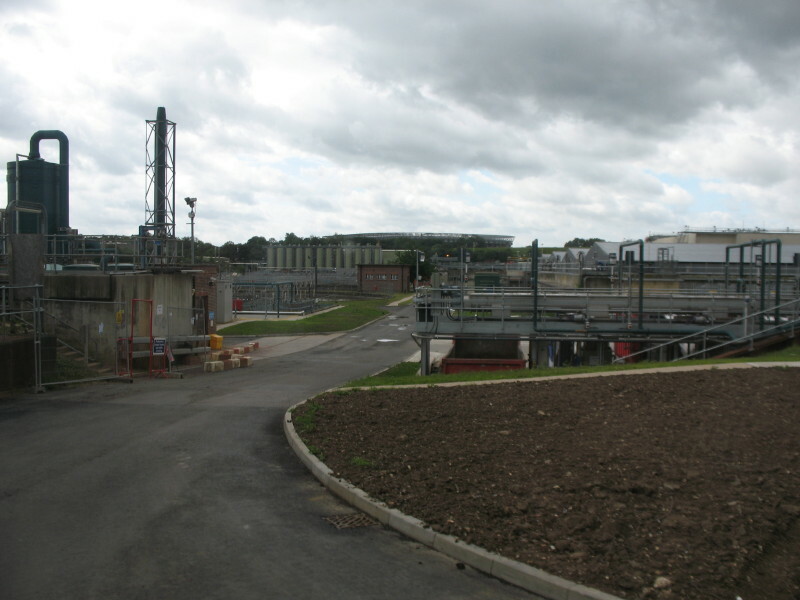 One of the largest sewage treatment works in Europe. 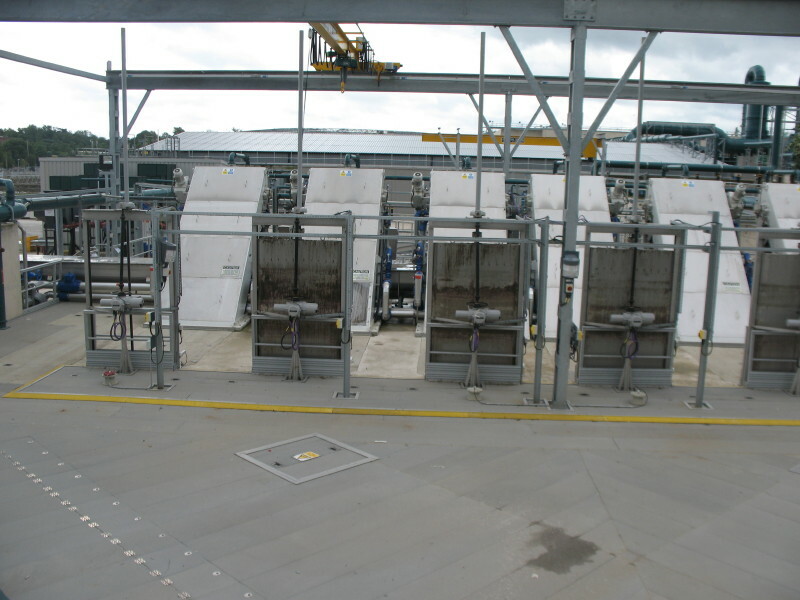 The site inlet screens. These are about 6mm square and remove everything that isn't proper sewage - grit, condoms, cotton buds, wet-wipes, and a lot of sweetcorn. I always knew the stuff was indigestible. A skip full of road grit is collected every day. Wet wipes are a big problem, I had an in-depth discussion with Martin Baggs about that. Kimberley Clark proudly showed off their new biodegradable wet wipes to him recently, boasting that they are in compliance with all European standards and will break down in only 2 weeks. 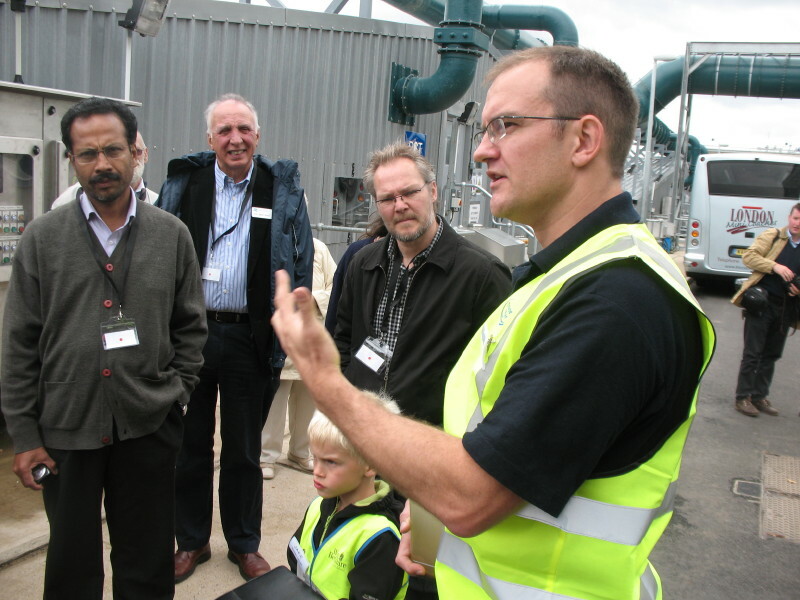 He said that they need to break down in 2 hours to be sewage-works friendly. I think he is on their case. Explanation of the first part of the process. All the new works are covered over to reduce smells. The "Mogden Stink" used to be infamous around Twickenham and Isleworth, on some days it was almost unbearable. 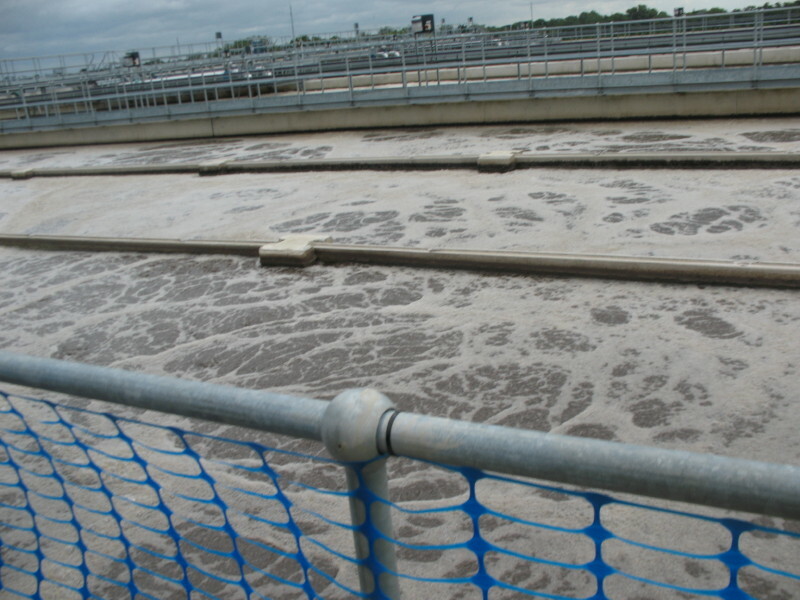 The smell is caused by Hydrogen Sulphide (sewer gas) which is highly pungent and toxic. Now all the smelly parts of the process are covered and the gas is recovered and treated. The dark green pipes take the H2S away to the towers for treatment. The Cappucino machine. The sewage flows through this vast tank and air is bubbled up through it to encourage aerobic digestion. This breaks it down very quickly. These tanks are very deep, and if you fell in you would sink like a stone to the bottom. Swimming would be impossible because the "water" density is reduced by the air bubbling up. The final settlement tanks. The end product compared with what comes in. The remaining sludge settles out at the bottom of these tanks and the clean water flows out the edges at the top. 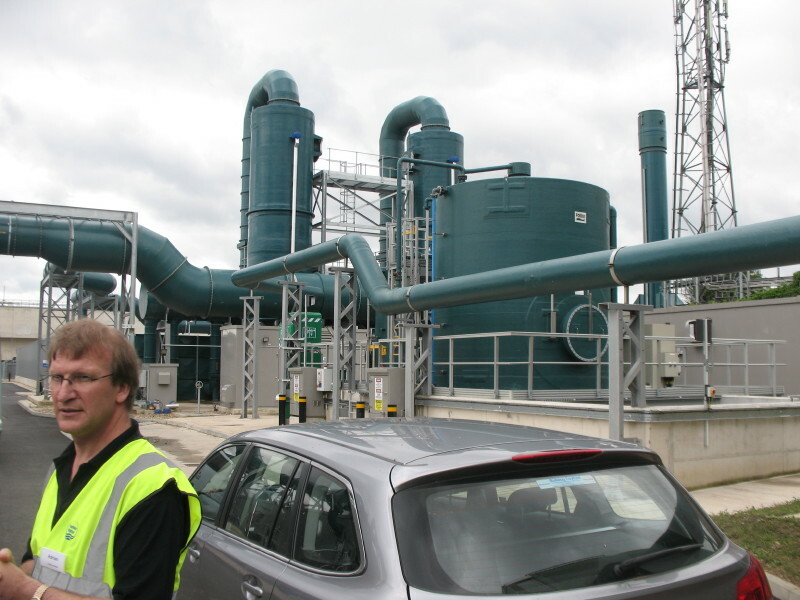 The sludge is scraped out and pumped to a sludge treatement works at Iver Heath where it is de-watered (by centrifuge) and made in to a "cake" which is used as agricultural fertilizer. 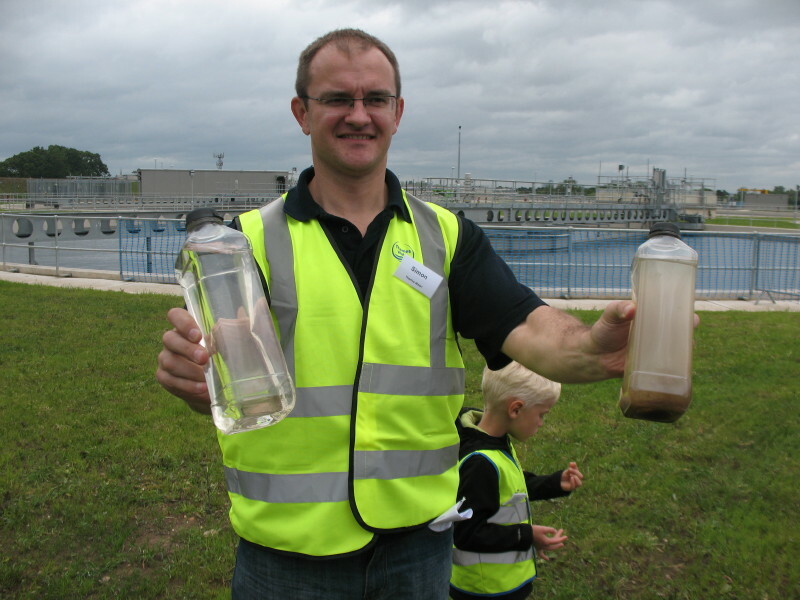 Much better than using wet sludge directly apparently as it does put too much nitrates into the water courses. Really quite an interesting morning, I managed to speak in-depth to a number of Thames people including one of their senior engineers who gave some good insights in to the problem of the Heathrow balancing ponds discharging into the Crane. Very worthwhile and good contacts made. "work with thames water"never thought i would hear that in this club. 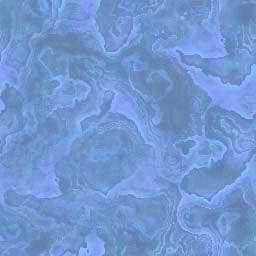 We have been 'working' with Thames on things like the Thames Tunnel, the extensive investigations into Thames abstraction.... Some days we kick them very hard, others we converse, always a 2 way street, beats going on a national radio station and slamming the phone done but each to their own. Suppose it depends if we want to clean up the Thames or not, it is easier to get it moving forward using an already open door than not. Having that open door was something we never had before, now we get all the answers, full transparency. Remember that us 'working' with Thames got the Crane £400,000 to restore it, blood money yes but pretty damn good job I think. But hey never mind. "work with thames water" never thought i would hear that in this club. One of the original reasons the TAC was formed was to stop the sewage going into the tidal. With Mogdn completed those huge discharges on the critical upper tideway have stopped in all but exceptional circumstances. That means also that the Teddington to Richmond pound is now pretty safe, at last. There will still be sh@t coming out of Hammersmith, Putney, Lots Road etc etc, but the very upper section is protected. We will still no doubt get fish kills but doubt ever on the scale of June 2011, or at least we hope. The next step is the Tideway Tunnel. We do challenge Thames but not over tax but performance, so how their infrastructure is, or not as the case maybe. Tax is for the inland revenue, we are concerned with the river. It's taken time to build relationships with them and the EA, no point in being shouty anglers wanting to kick every door in, when those doors are already open. And Ed sums it up nicely. I could go on, and on but just finished a 12 hour night shift, yes there is another life to manage. 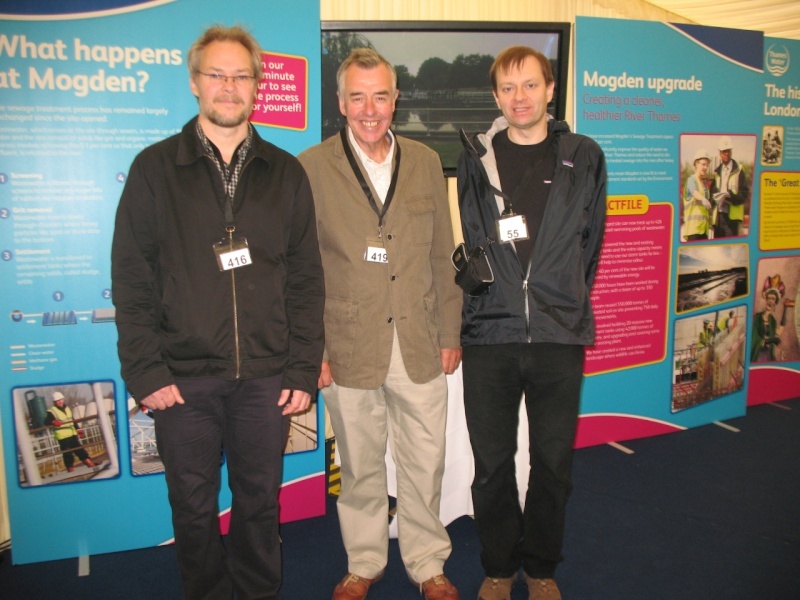 TAC have actually visited Mogden previously (as a special trip, not a public open day) in April 2010. Nice work gents and thanks for continuing to push our interests. The time and effort you continue to invest is appreciated. Fascinating report Ed thanks for posting it up with all the pics. A scientist friend calculated Mogden will still be responsible for major fish kills every 4-5 years despite the £140M upgrade. He wrote to Thames Water who said that following the upgrade, they don't expect another major kill for 8 years. There are only two ways to stop them forever and they are either separation of foul from surface water or green infrastructure to stop rain water from entering the sewers in the first place. Thames Water are not interested in either. The first because they say it costs too much and the second because they have no powers over surfaces where rain falls. Hi Roland, I'd be interested to see your friend's calculation, also the letter from Thames expecting a fish kill every 8 years. Separation of foul from storm water is of course the ultimate solution, but I don't doubt that it would cost a lot. Digging up every single road in the capital and putting in new storm sewers? Looks like everyone spoke too soon. 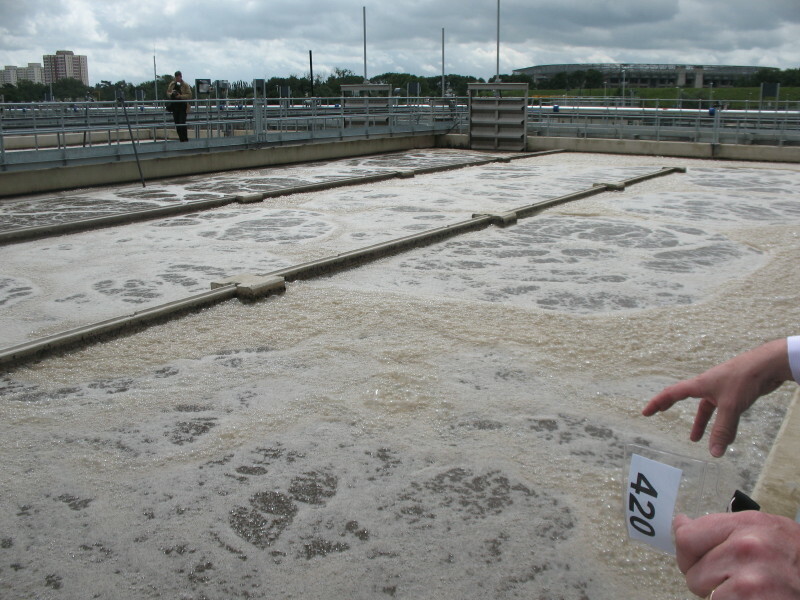 Mogden spilt 81,000m3 of untreated sewage on 28th May; after completion and before the “official” opening party. That wasn’t in your report so I guess Mr Baggs forgot to mention it. Thames Water says it was just bad luck that it had rained and there was a high tide that day. £140M of our dosh spent and it still doesn't work! What faith in Thames Water competence does that give you? 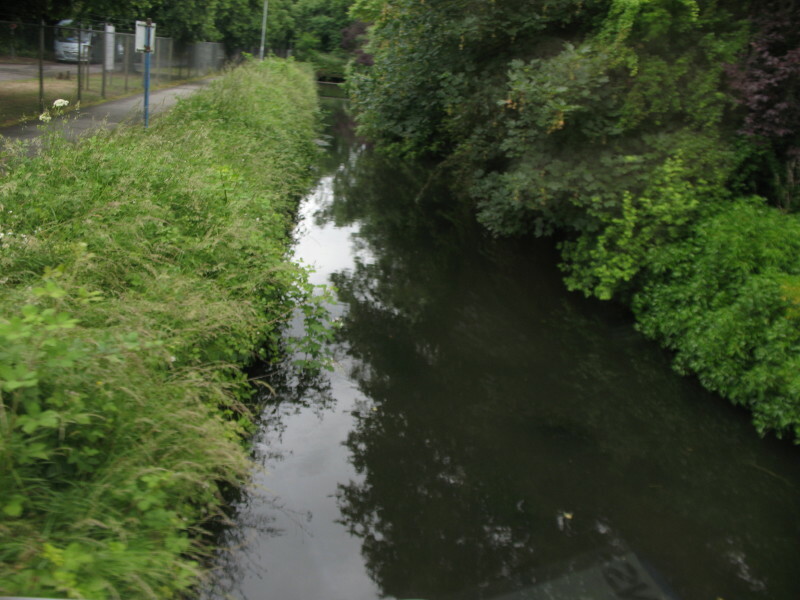 The SuDS (Sustainable Drainage Systems) Regulations have been around since 2006 and in law since 2010 but they have not been enacted by the current minister, Owen Paterson. He seems more interested in getting us to eat GM foods than helping to clean up our rivers. As you say, SuDS (rather than green infrastructure) were supposed to have been applied in law to all new developments by now but the government keep delaying implementation. It is currently proposed that they are enacted in 2014. Luckily, a lot of responsible architects have been designing new buildings incorporating SuDS or green infrastructure anyway. Green Infrastructure includes shallow reconstruction of secondary roads using porous (not permeable) surfacing with a 300-450mm reservoir layer (25% voids) underneath. The roads are laid flat and have no road gullies (cyclists love them). Rain goes straight through the surface and is collected in perforated pipes laid in the reservoir layer. 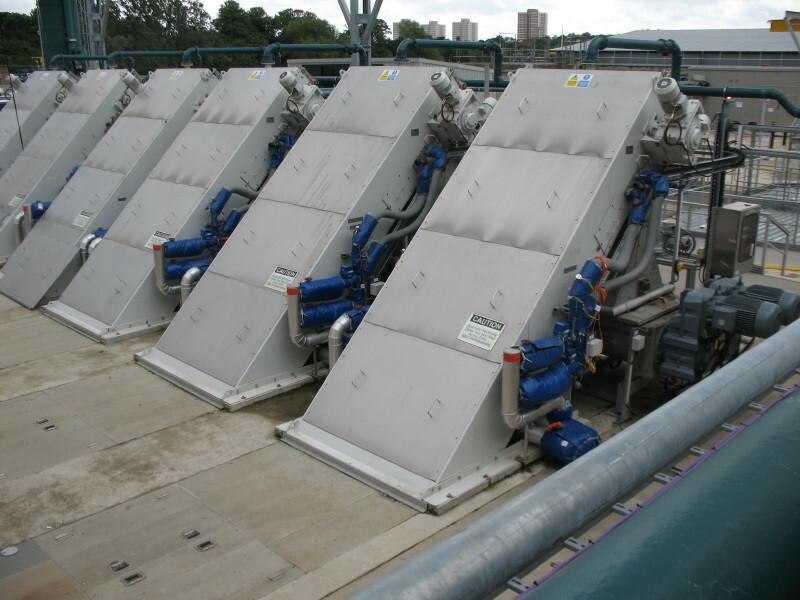 The collected water is retained and allowed to enter the sewers slowly at a pre-calculated rate using off-the-shelf attenuators that go down to 1 litre a second (or less) and for larger areas can be controlled in real time. You’ll be hearing a lot more about “real time controls” over the next few years. In London, secondary roads are resurfaced on average every 29 years. Keeping to the existing resurfacing programme, 33% could be reconstructed within 10 years. There is little additional disruption involved in shallow reconstruction (above utilities) and once it's done, it's done forever. Virtually all the excavated material can be recycled. Where the sub surface is permeable (about a third of London is on gravel, sand etc.) water can soak away naturally to ground. Calculations show that resurfacing 45% of Inner London roads would solve the rainwater issue on its own at a saving of £1Bn against the capital cost of the tunnel. The bigger advantages come from other issues such as creating thousands more jobs than the tunnel and creating a lasting “Green Economy” for London. The manual skills required do not need a degree and could be aimed at the army of idle young people currently living off the bank of mum and dad or on benefits. Green Infrastructure is more than roads. For example it includes street trees and green roofs. The GLA did a green roof survey year before last that found 10,000,000m2 of roofs suitable for retro-fitting as green roofs within 6km of Trafalgar Square alone. There are 3 basic types of green roof the best being those that will not only take up rainwater such as sedum but that support wildlife too. In London Borough of Lambeth they are aiming to produce 30% of the food they eat by bringing into productive use roofs and other unused open areas within their borough. A massive issue in London at present is poor air quality. It is known to lead to about 8,000 deaths a year. Increasing planted areas is one of the most economic ways of improving air quality while giving building owners superior energy savings than other types of roof. Believe it or not, London is already quite green. 65% of land area is either green spaces (parks), gardens or open water. Recent advances mean you can even fit green roofs on slopes up to 30 degrees which means the potential is even greater than the GLA Green Roof Survey. We all want a clean river and the trick is to get it at the lowest cost that has the greatest additional benefits, greatest resilience and flexibility to cope with the effects of climate change. Green Infrastructure offers just that. Although required to do so under an EU Directive, neither the government nor TW have done any comparative “Whole of Life” costing. When they eventually get round to it, they will find that even the high cost of separation is less than the tunnel and Green Infrastructure, less than a third. A big question no one has asked is what will they do when the concrete tunnel has to be re-lined (optimistically, after 100 to 125 years). Build another tunnel to divert the flows to? Thanks for posting Roland, appreciated. Just on the 81000m3, we challenged it as well, this is what they came back with and are pretty satisfied with the reply. The situation on 28th May was a result of two factors. Earlier in the day, heavy rainfall had caused the works to begin to fill its storm tanks. All of tanks (except tank 8 - explanation below) were filled. Normally, following the cessation of the high rainfall, the tanks would have been emptied back through the process and treated along with the incoming flow. On this occasion, however, the works became ‘hydraulically locked’, due to a very high spring tide that the EA alerted us to the previous day. 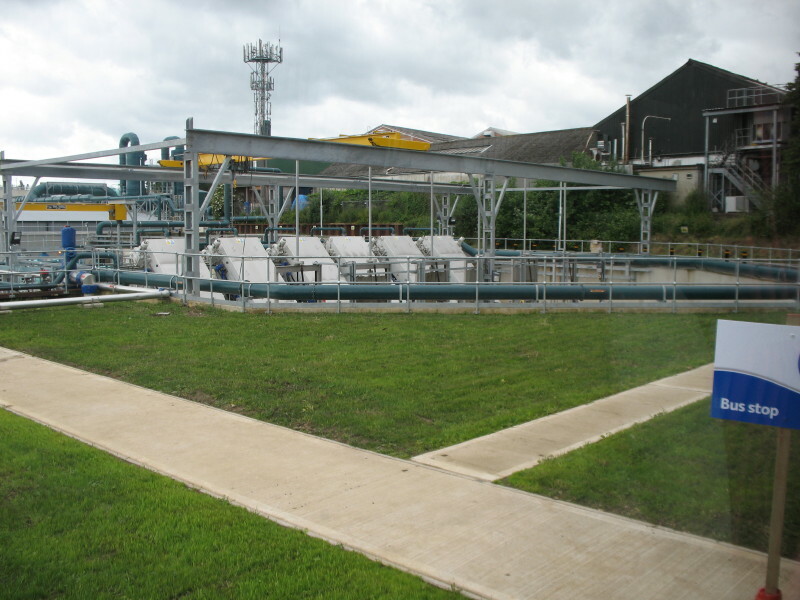 This simply means that the level of the river became so high at the peak of the tide, that it actually ‘backs up’ the treatment process , and prevents the treated effluent from discharging under gravity. While this high tide effect persisted, the incoming flows had to be diverted to fill tank 8, which is kept empty expressly for this purpose, but this tank filled very quickly because of the high incoming flows. As the tidal effects ebbed away the process controllers began to open the flow to treatment again. If they had done this any earlier, saline water intrusion into the works could have killed the bugs and caused a breakdown of the treatment process. However, 81000m3 had discharged to the river by this time. High tide impacts are a recognised feature at Mogden, and covered in our permit from the EA, but are not entirely predictable. The lunar cycles, that have the greatest impact, occur twice a year, but the severity of each event will be affected by the river flow at the time, as well as off shore storms. In addition, the operation of the Thames Barrier can have an effect. The EA will notify us of the severity and predicted duration of these events as they occur. On this occasion, the notification expected the tides to remain high for a duration of 5 days . Had the heavy rainfall not preceded this particular high tide event, it is highly unlikely that Mogden would have discharged to the river at all, as the overall capacity of balancing tanks (storm or otherwise) is some 90,000m3, and the volume discharged was 81,000m3. Well done Ed and Dave. It sometimes tastes bitter to talk to 'the enemy' but it's the only way that you can realistically achieve your goals. From my chats with Dave, I, as a humble member of the TAC, know that you would not cross the 'red lines' that our membership hold to.